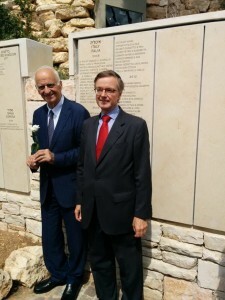 The ceremony of bestowal of the title of Righteous among the Nations to Sebastian de Romero Radigales took place at Yad Vashem, on September 30th, 2014. The award was received by his granddaughter, Elena Castelli, who especially flew from Italy for the occasion. Romero Radigales, Consul of Spain in Greece in 1943, went out of his way to help and protect the Sephardic Jews of Athens and Thessaloniki, contradicting the orders from his own superiors. The Wallenberg Foundation carried-out a thorough research into the life-saving actions of the Spanish diplomats, including the collection of testimonies and the presentation of a thick dossier to Yad Vashem. In mid April 1943, Sebastian de Romero Radigales arrived in Athens following his appointment as Consul General of Spain. Ever since his arrival to the Greek capital he devoted all his efforts to defend the Sephardic Jews (more than 800 people in the communities of Athens and Thessaloniki). In this framework, he invoked, like his colleague, Sanz-Briz and others, a decree which dated back to 1924 which offered the Sephardic Jews the possibility to benefit from the Spanish nationality, without specifying the exact requirements. In a document dated April 30, 1943, which was kept in the Register of the German Ministry of Foreign Affairs, the German Ambassador in Athens, Gunther Altenburg, repudiates the repeated demands made by Romero Radigales, which forced the Nazis to postpone the deportation of several hundreds of Jews of Sephardic ancestry. As a consequence, the Nazi Ambassador requested the involvement of his own Foreign Ministry to demand from Madrid to instruct Romero Radigales to stop interfering with the deportations. Radigales made relentless maneuvers before the Nazis aimed at postponing the deportation of the Sephardic Jews of Thessaloniki. His humanitarian mission was crowned with success between March and August 1943. Later on, in September 1943, already in Athens, he did his utmost to repatriate them to Spain, in accordance to an agreement with the Nazis which was not fulfilled by the Franco regime. Isaac Revah and ambassador Fernando Carderera. Romero Radigales took bold initiatives that enabled the evacuation of 150 persons from an Italian military train and struggled to the very last minute to thwart the deportation of the resting 367 people, causing deep upset among the German authorities. His efforts were fruitless at first, but in February 1944 he succeeded to get the authorization from the Germans to transfer the deportees to Spain. At the same time, he gave orders in due time to safe keep at the Spanish delegation the assets of the deported Sephardic Jews, in an effort to prevent confiscation by the Nazis, and taking the necessary measures to allow the restitution of the assets to their legitimate owners. Sebastian de Romero Radigales is the seventh Spaniard to be awarded the title of Righteous among the Nations, a tribute to those Gentiles who saved Jews during the Shoah. 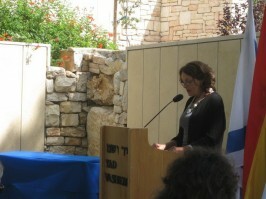 Elena Castelli expressed her profound gratitude to the Wallenberg Foundation, an education NGO presided by Eduardo Eurnekian and founded by Baruch Tenembaum. 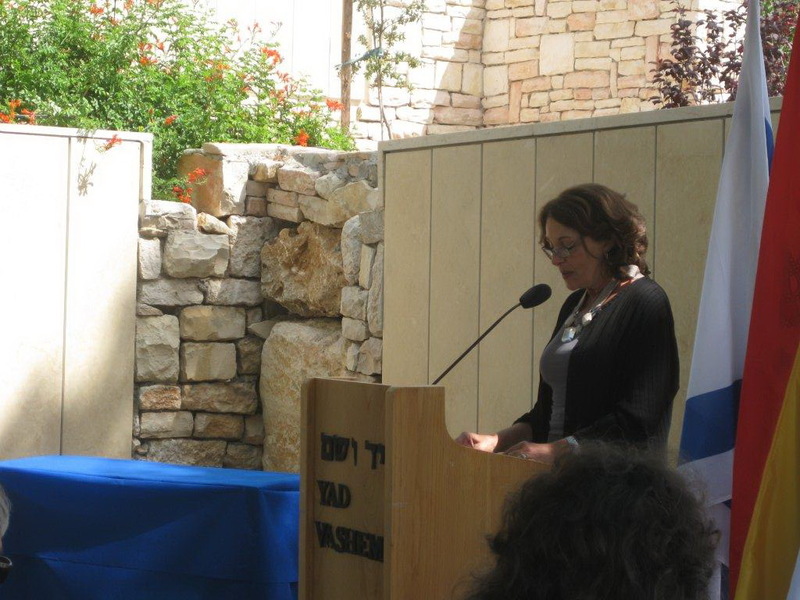 At the same time, she thanked Dr. Isaac Revah (saved by her grandfather), Centro Sefarad-Israel, an organization that secured important r documents from the Spanish Foreign Ministry and Prof. Haim Avni, a prominent historian from the Hebrew University. Dr. Isaac Revah presented a moving testimony, indicating that he as well as Mr. Yehuda Saporta, who was also among the audience, lived in first person the dramatic history, managing to escape the camps of extermination thanks to Radigales. Even that a group of Sephardic Jews was imprisoned at the Bergen Belsen Camp, the Spanish diplomat negotiated with the German and Spanish authorities until he secured their transfer to the Spanish Morocco. Revah and Saporta were among that group. Closing the ceremony, the Ambassador of Spain in Israel, HE Fernando Carderera, indicated in his speech that Spain is proud of its Jewish legacy. The head of the Spanish diplomacy in Israel paid tribute to the Wallenberg Foundation and greeted the delegation of the NGO, headed by Daniel Rainer, Viviane Epstein and Evelyne Noama.